The undergraduate actuarial science major is offered through the Weissman School of Arts and Sciences’ Department of Mathematics. According to College Choice, students are provided with a broad curriculum and can also enroll in courses at the Zicklin School of Business. 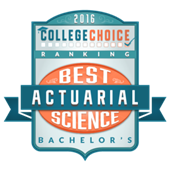 The College’s actuarial science program specializes in preparation for work in the insurance industry. To this end, students are trained in mathematical foundations and also in computational techniques, applied mathematics, and financial modeling. Students are encouraged to consider preparing for the official examinations administered by the Society of Actuaries, and majors should be prepared to pass all five upon graduation. Baruch was ranked ahead of New York University, SUNY-Binghamton, and the University of Connecticut. A complete list of the rankings can be viewed here. The rankings are based on multiple sources including, college freshman polled during a nationwide survey published by the Higher Education Research Institute at UCLA. These students rated academic reputation, financial aid offerings, overall cost of school, and the survey also took into account graduate success rates on the post-college job market. These factors were weighed equally alongside data from other publicly available sources, including U.S. News & World Report, the National Center for Education Statistics, and PayScale.com.